The bungs on my radiator have rusted off and the whole thing needs to be replaced. Is there another brand i should be looking at? I want the truck to stay cool, but dont wanna spend more than i need to. There are about $250 for a 3-row, and $180 for a 2-row. i think 2-row is stock? But i think i might just go with a parts store radiator for now if the price is right. i've had good results with a parts store rad (Advance Auto here in the northeast) with another car. 2 row is stock. If you're running stock parts and It's just a back and forth to work rig you don't really need the 3 core. Now it won't hurt to go bigger, it just may be overkill. If you're going to build it up and you're going to be hauling especially up steep grades, the 3 core would make sure you don't get to hot. One thing to consider is that most 3 cores will need some slight modifications. Since they have an extra core they tend to be a little thicker. 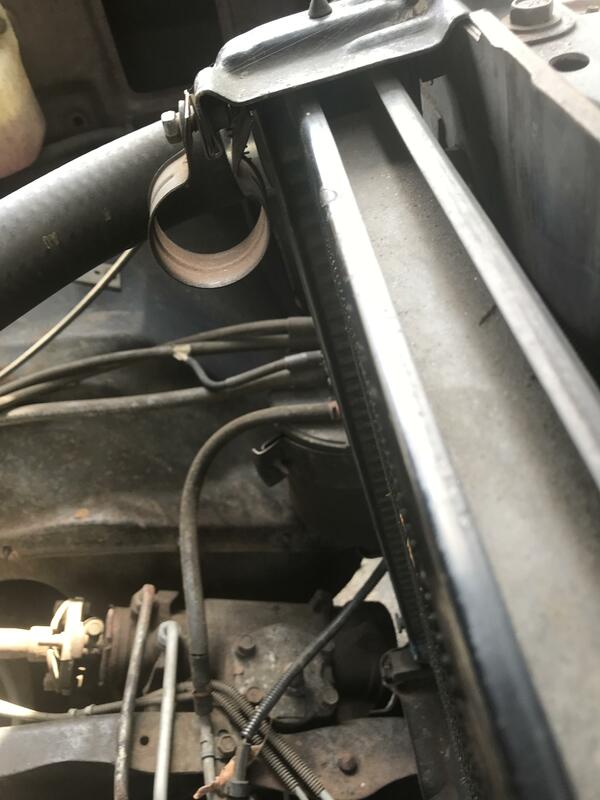 You may need to modify the rubber on the brackets that hold the radiator in place or get new rubber that was molded for a 3 core unit. So,3 row is stock? Or 2? its going to depend on the setup. dont think its just on engine size but GVWR like the rad in a inline 6 on a ½ton wont be the same as the inline 6 on a 1 ton. Most aluminum 2-rows are wide cored, meaning surface area to cooling capacity is equal to a 3 core, sometimes even a 4 core. Unless you plan on a lot of heavy towing, or lots of really slow trail riding, a typical 2-core aluminum will work fine. 1) i don't see a part number listed for a 81-87 c-10 for AC Delco? 2) Griffin has recently had not good reviews. 3) Mishimotos appear to have a good product and virtually all great reviews and the price is reasonable at $320-ish. 4) Be Cool # 60013 and 62013 seem to be high-quality, but i don't think i need to spend $600-700. Not exact fit according to several reviews. So do i have a 2 row or 3 row radiator? I'm guessing from the width it's likely a 2 core, the best way would be to take the cap off and look. Cores refer to the number of tubes front to back, so you could also try to look through the fins, typically they are close together and makes it hard to determine if it has more then two rows. I've seen a lot of 2 core radiators on the small v8's. Not sure if completely original, but they were all brass/copper construction. So how do i get this thing mounted? Can you get a picture of your old radiator and mounts? Sounds like you have a big block/or HD radiator stock. They are a 19" core, which make them about 21" tall. Small block/light duty radiator have a 17" core, and sit about 19.5" tall. A lot of radiators are measured by core size, not actual size. The core is just the array of tubes and fins between the tanks. Do yourself a favor and get the correct size to fit. Worst case is to modify the rubber mounts like I did.